Mason County Sheriff Kim C. Cole is a 7th generation Mason County resident and great-great grandson to Sheriff Henry Cole who served as county sheriff from 1899-1903. 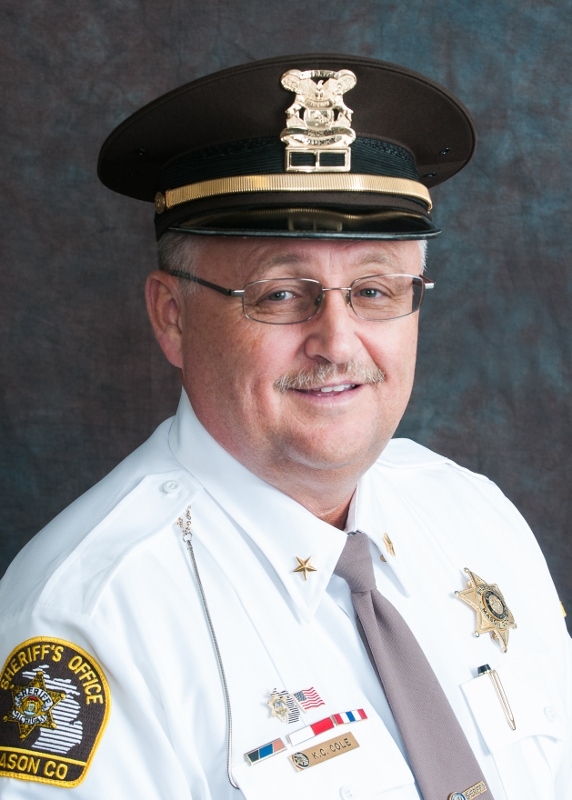 Sheriff Cole graduated from Ludington High School in 1982 and West Shore Community College in December of 1984. At age 20 he was a member of the Mason County Sheriff’s Reserves and at just over 21 years-old, hired on as a marine patrol deputy. Following the summer of 1985, Sheriff Cole was hired full time as a Deputy Sheriff working various duties including Corrections, Dispatch and Road Patrol. Sheriff Cole was promoted to the rank of sergeant in 1993, undersheriff in December of 2012 and took the Oath of Office of Sheriff Mason County on January 1, 2013. Sheriff Cole was the county’s first D.A.R.E. officer from 1990-1994 and headed up the agency’s crash re-construction team from 2001-2012. The Sheriff served as past president of M.A.T.A.I.—the Michigan Association of Traffic Accident Investigators and currently serves on the board of directors. His commitment to the field of crash reconstruction has earned him the respect of fellow crash re-constructionists and court recognition as an “expert witness” in that field. He received the Red Cross Life Saving Award in 1985, MCSO Deputy of the Year in 1990 and Ludington Optimist Club Officer of the Year in 1992. Among Sheriff Cole’s many other awards and accomplishments received, he holds two near to his heart, a 2003 Distinguished Service Award for courage and commitment following the murder of a Michigan State Trooper and a 2010 Departmental Citation for professionalism and dedication to duty for his response and handling of the homicide of a child. Sheriff Cole is the 23rd Sheriff to serve the citizens of Mason County.